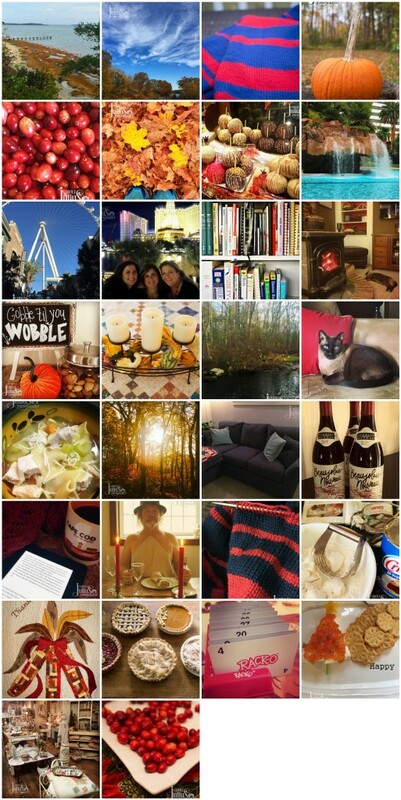 The problem with posting every day in November is that this photo mosaic might be a bit, well, anticlimactic. In other words, I’m pretty sure you’ve already seen most of these photos. S’alright, though, because they always look different when viewed collectively for the month. All the good stuff I said I did in November? It’s all documented right there. I see so much good stuff in that collage – friends, family, good food and drink…and even a bit of knitting. Looks like a wonderful month! (I still need to add the last few days to my collage – I think there are going to be a few new stories to tell when I do). There are several of these photos that I don’t remember, which is just fine because I get to enjoy them along with the ones I do remember! Always a pleasure to view your life’s events (and “non-events”) through the lens of your camera. That collage doesn’t begin to show all the joy you had in November, even as wonderful as the pictures are! Ah, but it doesn’t hurt to see them again — and all together!! Lots of fun and good times. You can never get too much of a good thing – which your photos always are! Thanks for sharing again. I still crack up when I see Dale with that napkin in front of him. Wish you knew how to,have fun lol! Dale as Guthrie totally cracks me up!